Diabetes can accelerate cataract formation and induce glaucoma. More commonly the diabetic patient is susceptible to a series of changes in the back to the eye (retina) called diabetic retinopathy. Vision comes from light entering the eye and focusing on the very sensitive receptors of the retina that lines the back of the globe. Detail driven central vision is provided by a concentration of receptors in the macula, located at the center of the retina. This tissue is supported by a rich vascular network that nourishes this tissue. Changes in the retina can be triggered by diabetes. 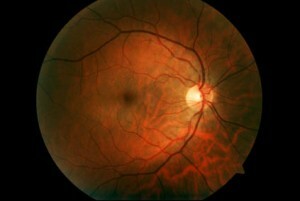 A Healthy Retina The retina of a patient suffering from diabetic retinopathy. Weakened blood vessels in the region of the macula can leak fluids causing the light receptors to be permanently damaged, causing central vision to deteriorate, in the early stages of diabetic retinopathy. Delicate new blood vessels are formed. 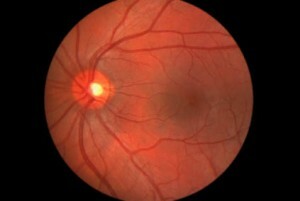 These fragile new vessels grow on the face of the retina and can rupture easily. These microscopic or micro-aneurysms bleed into the vitreous . The leaking blood creates a cloud that obscures the retinal receptors, blurring or blocking vision. Scar tissue can form at the site of the leak tightening and pulling the retina inducing detachments leading to severe vision loss. The treatment of choice is photocoagulation, where small bursts of intense heat from a laser, focused on the leaking vessels, stops the bleeding. The resultant scars reduce abnormal vessel growth and help to “spot weld” the retina to the globe. Early detection, exercise, controlling blood sugar levels and some preventative laser therapies can preserve your vision. See your eyecare practitioner annually. Parrelli Optical® recommends aggressive monitoring of the diabetic eye. Call for an appointment now.